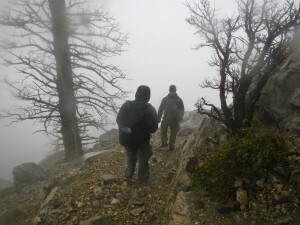 Most people avoid the dreariest of conditions when planning their hike. Not us! In fact, sometimes getting out into the elements is exactly what we are looking to do. Call us crazy. 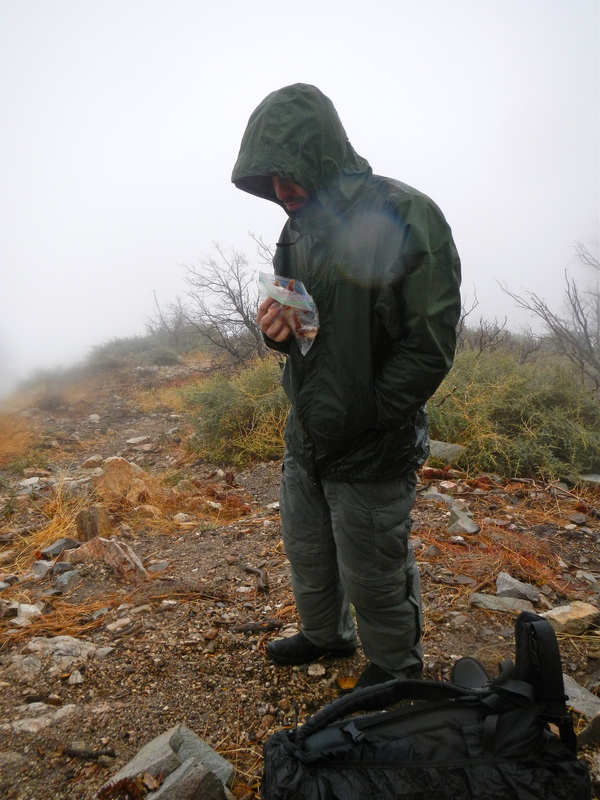 Maybe it’s because I grew up with more seasons and varied weather, maybe its because southern California is basically a desert, I’m not sure… but I can’t deny the cold and soggy serenity that can be found when venturing out into the rain. So, like a pre-dawn Larry, Moe & Curly, we met in the early morning rain outside of Wardance Training Center for the drive to the trail-head. A special thanks goes to Shirley, of Shirley’s Bagels in Costa Mesa, for making our commute more bearable and overloaded with cream cheese. We arrived as dawn broke and marched into the fog. 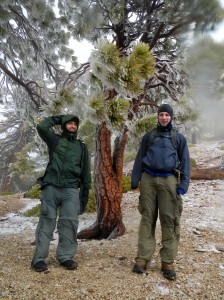 The tree cover gave us some shelter from the wind, but staying dry was instantly an issue. I’m pretty sure rain permeated the outside layers while sweat permeated the inside layers. Gotta love 100% humidity. Luckily, a very small break in the weather allowed us to linger at one of the lower overlook points for a few moments. Too bad we couldn’t really see anything. After reflecting on the potential breakfast specials being served fireside at the Baldy Lodge, we soldiered on. As we switched back and forth above the bear flats, the weatherman’s prediction became increasingly accurate. 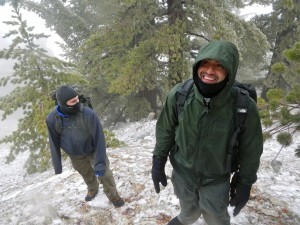 By the time we reached the ridge, we were all felling the chill and needed to refuel. We turned our backs to the wind and silently ate our PB&Js. 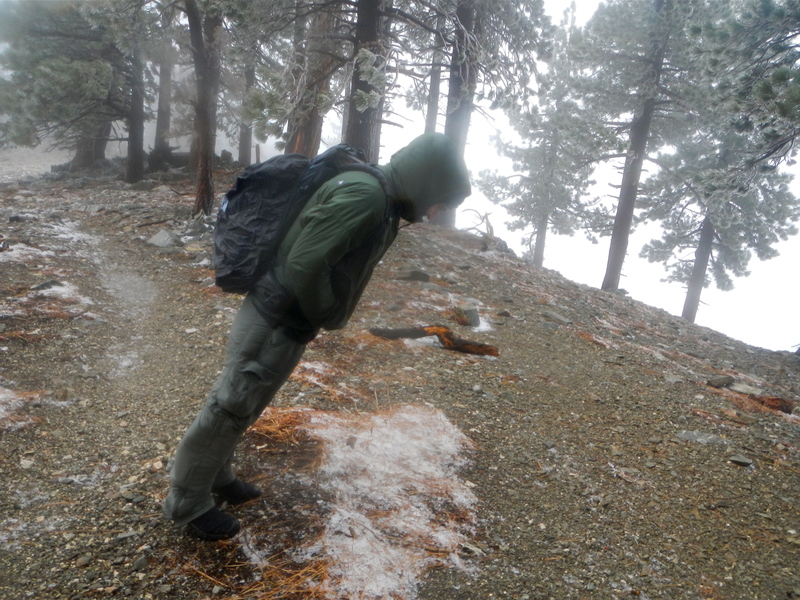 For those of you who haven’t been up the Bear Flats trail in the winter, Baldy seems to get its fair share of frozen rain. While there can be deep snow drifts, frozen trees are also a common sight. Beware – these trees can shed chucks of ice when you least expect it. Heads up! The wind was so strong at times, it would push you right off the trail. We looked like a bunch of stumbling drunks! I was surprised how much energy it took to deal with the wind. It slowed our progress and seemed to make us very hungry. Here is a photo of Anis leaning into the wind… doing his best “Smooth Criminal” impression. 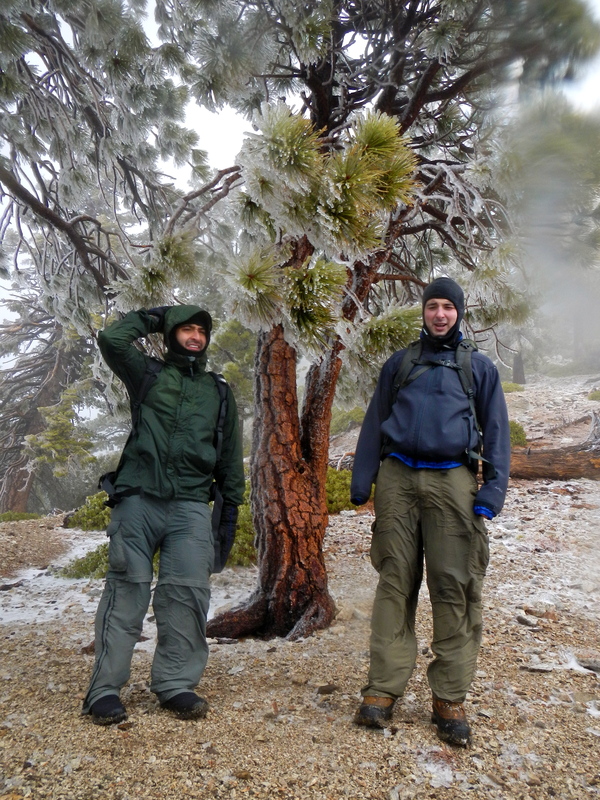 To avoid the most brutal and chilling gusts of wind, we eventually broke off the trail and hiked over to the other side of the ridge. Once on the more sheltered side, our spirits were immediately re-energized. I was happy to learn that Anis & Sahba were thoroughly enjoying the abysmal weather. I was too. Heh, now it’s certain – we are all certifiably crazy. After messing around a bit and eating our lunch we decided the summit was not necessary. 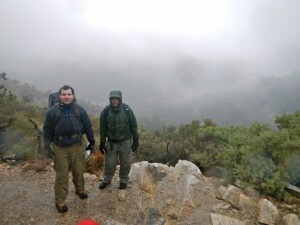 Perhaps it was the idea of being blasted by the wind and rain again (once we crossed back to the other side of the ridge), perhaps it was because our goal (to get outside and play in the rain) had already been accomplished, but the release of a summit requirement only increased our revelry. It allowed us to relax a bit and enjoy the hunger induced shivery delirium we had created for ourselves. 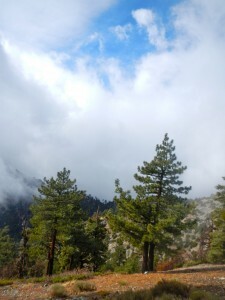 As we began to descend that afternoon, a miraculous thing happened — the clouds broke, the winds calmed, and we got a solid 8 minutes of warm and beautiful sunshine. Anis, Sahba and I basically stood there for all 8 minutes, dumbfounded by the sun’s relative comfort. When the cloud cover and rain rolled back in, we were pretty much in agreement that it was time to head out. 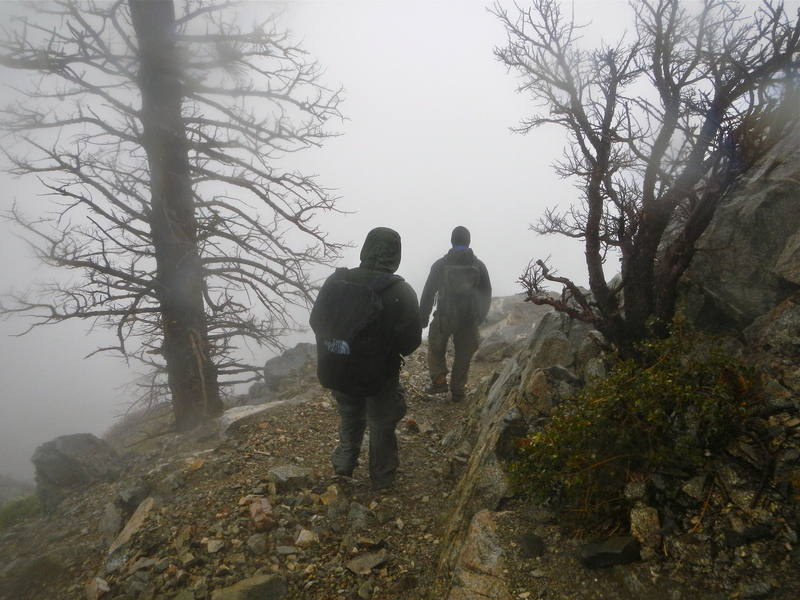 The fog in the canyon was even thicker than when we ascended, making our exit uneventful. There aren’t many details when you are hiking in the soup. So thanks to Baldy. 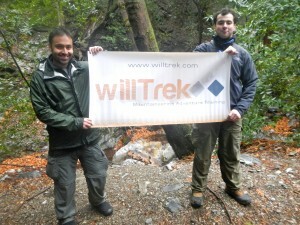 And thanks to Anis & Sahba for being the type to embrace some errant adventure and all that mother nature has to offer. As cold and soggy as it was, I know you both enjoyed it. If sleep was applause, they both gave me a standing ovation for the entire ride home. HA! I can’t wait till we get out there again!